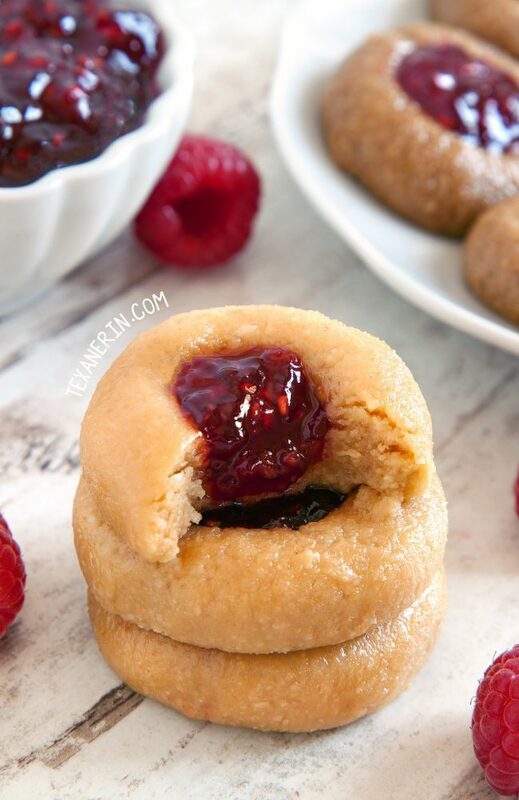 These no-bake peanut butter and jelly thumbprint cookies are naturally vegan with a paleo and nut-free option. Thanks to Bob’s Red Mill for making today’s post possible! I used to hate natural peanut butter. The flavor was never as strong or as tasty as with the junky commercial kind or the “natural” variety with added fat and sugar (that I don’t consider natural at all). And I’m still not happy with it in peanut butter cookies. 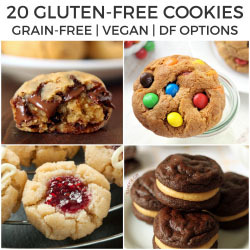 I’ve tried at least a dozen different grain-free peanut butter cookie recipes and although I enjoyed the dough, I was always disappointed with the outcome. Then I realized I was being dumb and that I could just not bake the dough! So here we are. No-bake peanut butter “cookies” with lots of peanut buttery taste! 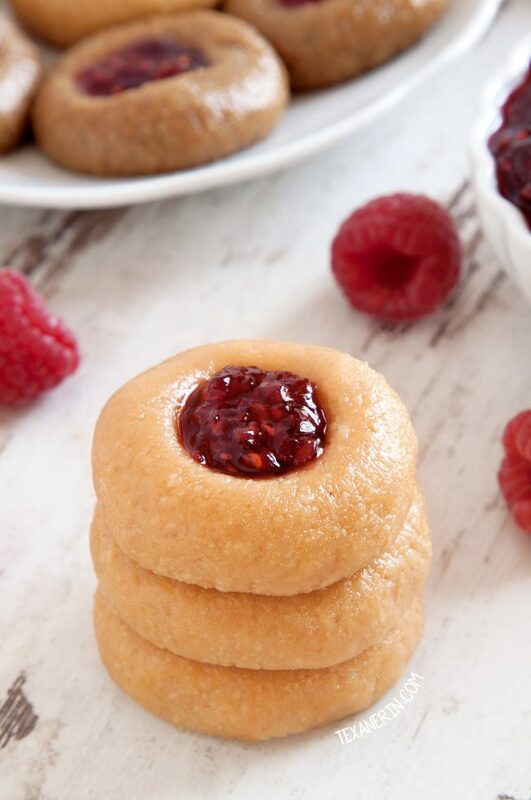 And because it’s summer and I’m feeling fruity, I added some raspberry jam to turn them into thumbprint cookies. For the paleo and nut-free alternative, you can use unsweetened sunflower seed butter (the kind with just seeds and salt – no added sugar of fat!). Just like in my healthier peanut butter fudge recipe, I had to add additional sugar that the peanut butter version didn’t need. And in this recipe, I also had to reduce the amount of sunflower seed butter (down to 2/3 cup from 3/4) and add extra coconut flour. It was just too greasy without it. And is often the case with nut butter + coconut oil no-bake treats, you’ve got to keep these refrigerated or frozen. You can still at least pick up the peanut butter version when kept at room temperature but the same isn’t true of the sunflower seed version. Like I mentioned in my perfect paleo chocolate chip cookies post, flour brands can vary a lot. I used Bob’s Red Mill super-fine blanched almond flour and coconut flour in the recipe listed below but I also tested it with a random German brand, just to see if there’d be any difference. By the way, have you seen that they now carry paleo baking flour?! I can’t wait to get my hands on some of that! In a small mixing bowl, stir together the nut / seed butter, maple syrup, coconut sugar (if using sunflower seed butter), coconut oil, and vanilla extract. Add the almond flour, coconut flour2 and salt and stir until combined. If it's too soft to roll into balls, place in the refrigerator for about 30 minutes. If you used sunflower seed butter, you'll likely need to do this. Roll into 20-gram balls (about 1") and place on a parchment-lined plate. Create an indentation with the back of a 1/2 teaspoon measuring spoon (or create whatever size indentation you'd like). Fill each with 1/2 teaspoon jam (or however much you'd like). Refrigerate for about 2 hours until firm and then serve. These need to be kept refrigerated or frozen. Use the kind with just salt and peanuts or sunflower seeds. If using sunflower seed, add 1 tablespoon to start with and add the rest, if needed, once everything is combined. It should be almost firm enough to roll into balls. For the nut-free + peanut-free version using sunflower seed butter, use 6 tablespoons (48 grams) - 1/2 cup (64 grams) coconut flour in place of the listed almond flour + coconut flour. You may also want to add a little more coconut sugar. Start off with 6 tablespoons and add a little coconut flour at a time until it's almost thick enough to roll into balls. 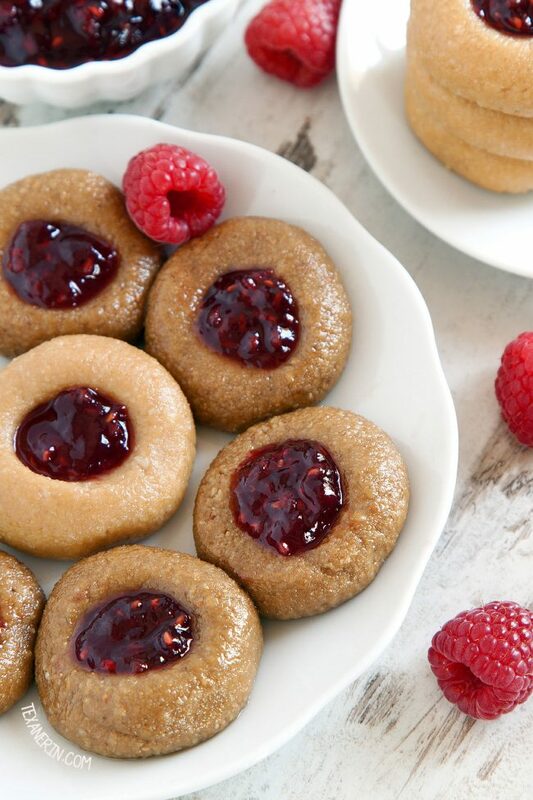 37 comments on “No-bake PB&J Thumbprint Cookies (vegan with paleo / nut-free options)” — Add one! No bake cookies are so nice! Don’t have to wait around for them to bake. Looks tasty! These look beyond wonderful, Erin! These sound super yummy! My kids (and I) would gobble them up. I love using Bob’s Red Mill grains they are so consistent so my recipes always turn out. Same here! I’m super exact when baking so I am all about consistency. :) Thanks for your comment! I love experimenting with different no bake cookies this time of year! Can’t wait to try these! I LOVE natural peanut butter! But you’re so right…there are certain recipes that don’t turn out right unless Jiff or Skippy is used! :) These look awesome!! Love that they’re no-bake so I don’t have to turn my oven on to make them! I just love thumbprint cookies! They always make me think of Christmas growing up. These are particularly beautiful! Oh my goodness, what a perfect summer treat. Love that these are no bake!! I can’t get enough no-bake recipes this time of year!! the cookies sound fantastic!! I love your idea of saving some of the dough to try as a no-bake treat! I actually wanted to bake some eggless macaroons recently and liked the dough so much that I just posted them as balls. :D Thanks so much for your comment! Those are lovely! I don’t think they would last long at my house… And, conveniently, I have all of the ingredients on hand! Can’t wait to give them a try! Yay! I hope you’ll enjoy them. 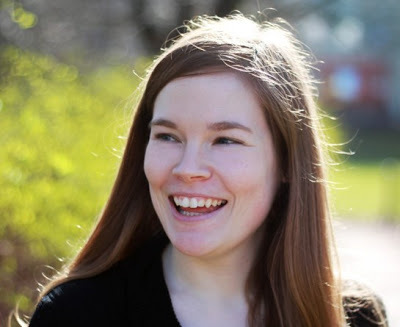 :) And that’s so awesome that you’re starting to like the homemade versions of things! I have never made this cookies before, but now I’m motivated as I also have the best apricot jam from my mom. Yummy! Awesome recipe. I can almost taste them just by looking at them. I love that they’re no-bake, have a huge peanut butter flavor, and that you added the jam for that final touch! I love that these are no bake! Lovely! I love all things Bob’s Red Mill. Loving these cookies using alternative flours. Saving this for the next batch of heat we are going to get later in the week. Love no bake in the summer. These look so good, I love that they are no bake! I’m probably missing something obvious, but for the nut-free version, what replaces the almond flour?